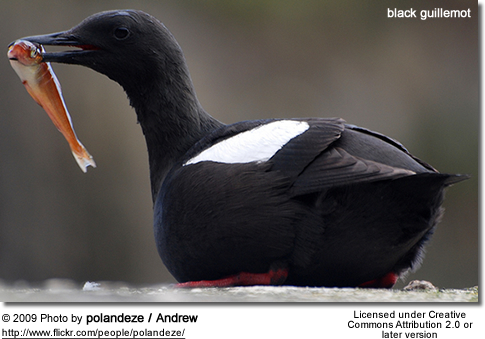 The Black Guillemot or Tystie, Cepphus grylle, is a black and white alcid. This medium-sized alcid measures t 32-38 cm in length and has a 49-58 cm wingspan. 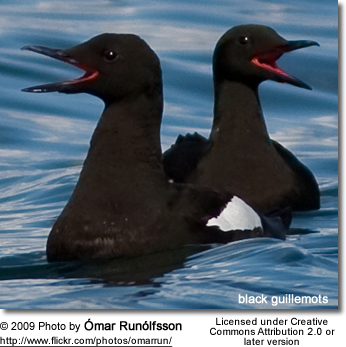 The adult plumage is mostly black with white wing patches. They show white wing linings in flight. In winter, the upperparts are pale grey and the underparts are white. The wings remain black with the large white patch on the inner wing.The bill is dark and thin. The legs and feet are red. 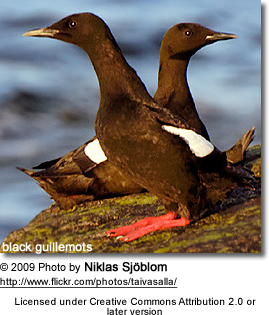 They breed on the rocky shores, cliffs and islands on northern Atlantic coasts in eastern North America as far south as Maine, and in western Europe as far south as Ireland. 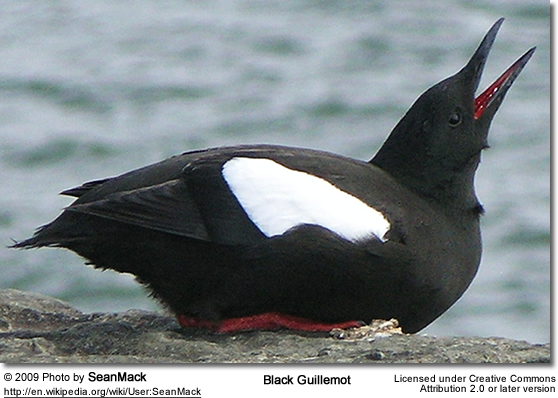 In the UK, this species is fairly common breeding bird in western and northern Scotland and Northern Ireland. In the rest of Great Britain they only breed at St. Bees Head in Cumbria, the Isle of Man and on east Anglesey in north Wales. 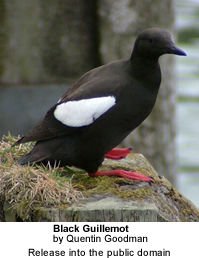 Some birds breed in Alaska where their range overlaps with the Pigeon Guillemot. They usually lay their eggs in rocky sites near water. 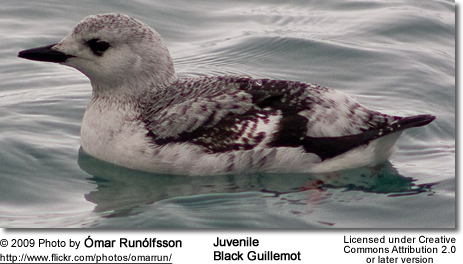 They mostly overwinter in their breeding areas, but may move to open waters if necessary. However, they usually don't migrate far south. They mainly eat fish and crustaceans, also some mollusks, insects and plant material, diving for food from the surface or swimming underwater.